I have found through my years of experience that several things are important in this business. First you must provide a QUALITY product at a reasonable price. Second you MUST get it back in a reasonable amount of time. Put those two together and Run your business with Honesty, Integrity and Good Character and the people will “find” you. “Word of Mouth” will always be your best advertisement!. With that said I welcome you to contact me with any questions regarding your “trophy” bird, be it your Dogs first retrieve OR the long sought out bird on your ‘list’. I cater to all phases of Bird taxidermy and look forward to creating a bird mount for your wall or collection that will bring back memories for years. 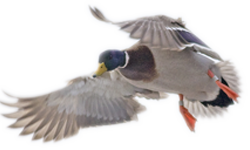 © 2013 Wildfowl Unlimited Inc.